Production of the new special edition Lexus IS 300 F is limited to just 900 units for 2019. After the special edition Lexus NX Black Line debuted at the Chicago Auto Show in January, the IS 300 F Sport is now also getting the Black Line treatment while we wait for the next-generation model to arrive. Limited to 900 units, the 2019 Lexus IS 300 F Sport Black Line adds new unique features and subtle styling changes. Available on both the rear-wheel drive and all-wheel drive IS 300 F Sport models, the Black Line Special Edition is distinguished from the standard model with 18-inch split spoke wheels that feature a "black vapor chrome” finish, a technology shared with the wheels on the flagship LS sedan. To complement the darker wheels, the Black Line Special Edition is also equipped with black side mirrors. Three exterior color options are available: Ultra White, Obsidian and Atomic Silver. Inside, all Black Line models come with black Nuluxe seats with red accents on the side bolsters and seat cushions. Red accent panels also adorn each side of the center stack along with contrasting red stitching on the seats, center console and armrests. The special-edition model also includes a heated black wood-trimmed steering wheel that with distinctive black shades created by a Japanese calligraphy shop that was founded over 200 years ago. All Black Line models also come equipped with Navigation and triple beam LED headlamps. Rear-wheel drive versions of the IS 300 Black Line Special Edition are powered by a 2.0-liter, turbocharged, four-cylinder engine that sends 241 horsepower through an eight-speed automatic transmission. The all-wheel drive Black Line Special Edition, on the other hand, is powered by a 3.5-liter V6 with 260 hp and a six-speed automatic transmission. 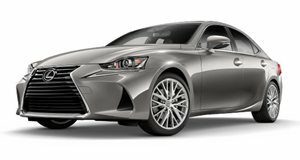 Production of the 2019 Lexus IS 300 Black Line started in early February, meaning the new special-edition model will arrive in dealers in March. Pricing details haven’t been confirmed, but expect to pay a premium over the standard IS 300 F Sport, which starts at $41,605 with rear-wheel drive and $43,655 in AWD. Note: the images below show the 2019 Lexus IS 300.